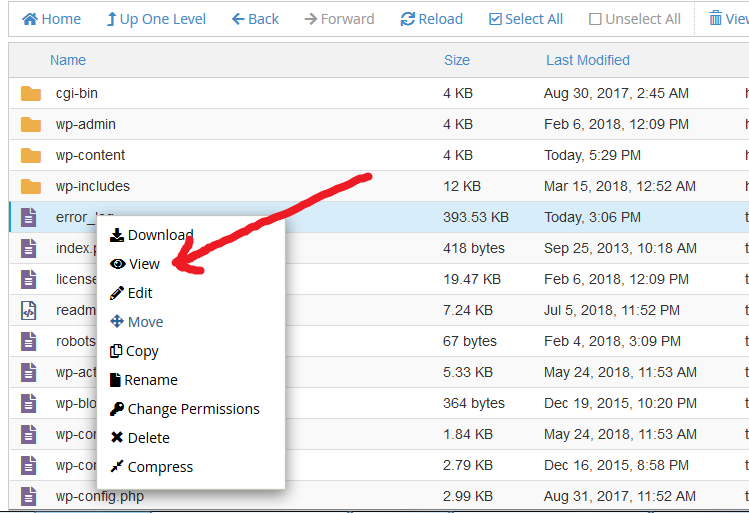 When you update theme, plugins and wordpress core files, by default wordpress put a .maintenance file under document root folder like /public_html if your installation under public_html. If it’s addon domain, you will find under addon domain folder. The update can take only few seconds. If the update stuck and wordpress unable to remove .maintenance file, you will see following message. Trying multiple updates at a time. We can solve it using two way. One is cPanel control panel file manager and another one is using ftp. First, we need to login our cPanel control panel. Then click on the File Manager. Then go to public_html. Delete the .maintenance file. That’s it – you will see maintenance gone from your website! Still didn’t fix your issue? Getting blank page? After removing .maintenance file, if you see the blank page in Mozilla Firefox and 500 Internal error in Google Chrome browser. Then you need to do more investigation. First, we need to check error_log in root folder like public_html. Open the error_log file in edit mode from cpanel file manager. After that, you will see the log file like this. So, How can we solve this error? We need to download the plugin from https://wordpress.org/plugins/ repository. Or if the plugin is paid, you need to download from author site. Then upload the plugin under “wp-content/plugins” using cPanel File Manager. That’s it. You will see blank page is gone and site is loading. How to prevent this issue? 1) Don’t update all at a time. Update one by one. 2) Make sure plugin and themes are compitable. 3) If you are hitting the resource limit, contact with provider.